These instructions explain how to create a bootable USB stick to install openSUSE from the LiveCD isos or from the DVD (which were originally intended for optical media). Warning: While these instructions might work for others distributions, it's recommended to check the desired distribution's own wiki to avoid any problem. Unplug the USB drive. It now contains a bootable openSUSE installation. Select the .iso file in Rufus with a click on the CD drive button located on the center right of the window. This should then automatically change some settings. Especially "Create a bootable disk using" should change to "DD Image". Click "Start". Rufus may ask you to choose one mode from "ISO Image mode" or "DD Image mode". Normally, "DD Image mode" should be used. The copy process takes a couple of minutes. Note: Because of bug #939456, you could try to use "ISO Image mode" for ThinkPad laptop, e.g. ThinkPad T470s, if you cannot boot the laptop with the USB stick made with "DD Image mode". Download ImageUSB and follow the instructions on their page. We used to have SUSE Studio ImageWriter compiled for windows, but this is not maintained anymore. Feel free to fork it and build/maintain the windows version yourself. This method will keep all current data in your USB medium. Demonstration is provided in this video. Note: These instruction will not work, if your computer boots via UEFI (like most computers made after ~2011-2012 and all computers with preinstalled Windows 8/8.1/10); at first you must go to BIOS, enable Legacy boot (i.e. dissable UEFI/secure boot option)! 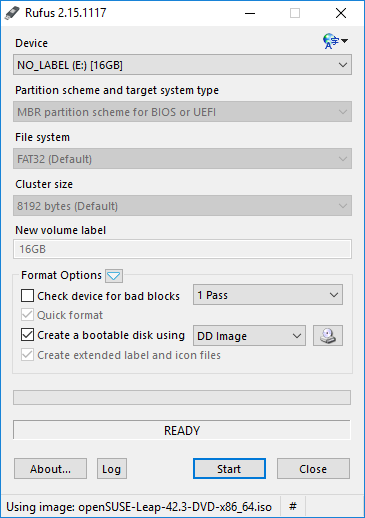 Copy ISO into "boot" folder of USB flash. Extract "initrd" and "linux" files into "boot" folder of USB medium. These files located in boot\i386\loader or boot\x86_64\loader directory of ISO image. For ISO mounting you can use, for example, Pismo File Mount Audit Package. confirm GRLDR copying into selected medium. Reboot your computer from USB stick. If you get write access problems with the USB drive you can try to reformat the drive in Windows prior to writing the image. This situation would happen very rarely, but in the even that your computer doesn't boot from the LiveUSB/DVD from the steps above, you might try the following procedure. Warning: Make certain you choose the number that corresponds to your USB device! Unlike fdisk, diskpart will perform changes as you enter them, therefore, there is no write instruction. This page was last modified on 25 March 2018, at 22:54. This page has been accessed 1,038,187 times.